You'll earn a Facewest Credit of £14.40 with this item. The Arcteryx Cerium LT Hoody is a lightweight sewn-through down jacket that uses the finest 850 fill power European white goose down, ensuring super lightweight warmth for those on the move. The Cerium LT offers superb mobility and and can be used as either a warm mid layer or as an outer layer in cooler conditions. This is the perfect choice for the ski tourer or alpine climber requiring warmth, and packability at a minimal weight. Down Composite mapping (DCM) is utilized in the Cerium LT Hoody. DCM is where Coreloft synthetic insulation is used instead of down in areas prone to moisture - the collar, chin, underarms and cuffs. These areas are also prone to down migration so the use of Coreloft eliminates this problem as it remains static within the jacket. Down is then used throughout the core and arms, where warmth is required the most. The outer fabric of Arato 10 is durable yet is still incredibly lightweight and also benefits from being DWR finished. The jacket is a trim fit and also features a low profile and down insulated StormHood ensuring maximum protection in the coldest weather. To keep drafts out the cuffs are elastic and it has an adjustable hem drawcord. It features two zipped hand pockets and an internal security pocket. The jacket comes with its own stuff sack for easy rucksack transportation. Arc'teryx say: "Streamlined, lightweight down hoody filled with 850 white goose down. This backcountry specialist hoody is intended primarily as a mid layer in cool, dry conditions." Okay, so first things first. Down jackets can be lovely things to wear, and that is one of the reasons you see so many people wearing them on the local high street! But at times I do wonder quite how practical they are for the UK market? Even Arc'teryx themselves say that the Cerium LT Hoody is primarily for cool, dry conditions, not exactly the sort of weather the UK is famous for! So, how did the Cerium LT get on? Did it cope with the damp of a British winter as well as it did with some cold, dry conditions in the French Alps? And did it cut the mustard on the street?! The Arc'teryx Cerium LT Hoody is perfect for cold, dry conditions such as this rare day on Ben Nevis. Since the Cerium LT Hoody arrived back in late October, I've worn it everyday. I have used it for break duties at work, going to the pub or for a wander round town, between attempts on boulder problems, thrown it on as an outer layer on lunch stops, skied in it in the Alps, used it as a belay jacket on ice and rock climbs and taken it out mixed climbing in Scotland. A lot of different things! So for one, it's really versatile. As an everyday piece of insulation in cold, dry weather, it is perfect. But like all down jackets, it doesn't like rain (despite the DWR finish)! Down loses it's ability to insulate when wet as it can no longer loft, it clumps together and cannot trap air meaning it can no longer keep you warm. 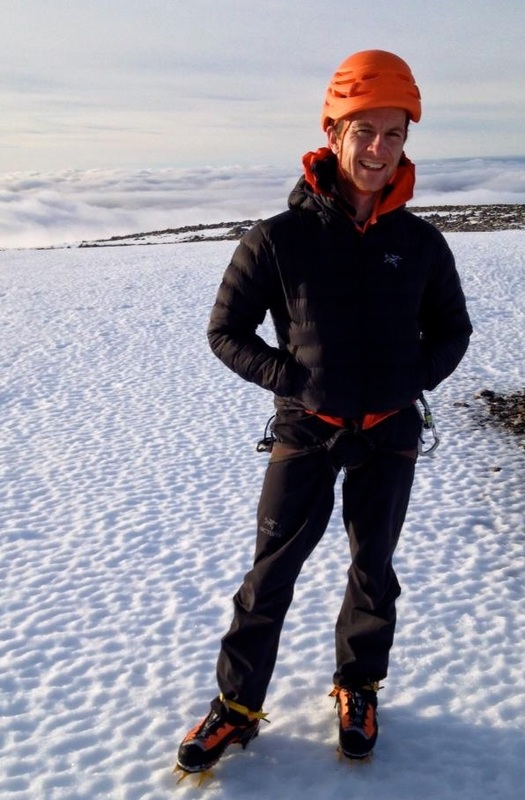 One of the Cerium LT Hoody's first outings into some real mountain conditions was a day mixed climbing on Ben Nevis. It was a pretty wild day where the freezing level was fluctuating massively and precipitation was high. In fact a friend of mine commented that I was a little cruel testing down in such conditions! I wore the Cerium over my softshell to keep me warm after the hike into the crag, so I didn't cool down while I geared up. Soft wet snow flakes and driving wind soon penetrated the outer shell and the down lost it's ability to loft and in turn lost it's insulating value. So why am I telling you this? Well firstly it's important to note what the jacket was intended for (cold and dry conditions) and that these sorts of conditions (damp and wet) do not match that intention. But it was good to try, as kit really needs to be thoroughly and properly tested if an accurate assessment of it's suitability is to be made! Whilst the Cerium LT did not come out particularly well on the Ben Nevis test, neither would any other down jacket. I have tested many, including some of the new expensive hydrophobic down garments and in damp/wet environments they are not going to cut the mustard as an insulator in the same way synthetic equivalents like the Atom LT Hoody would. However the Cerium LT Hoody did recover from this very well indeed. And what is apparent, is that the cold, dry conditions it was designed for, it eats for breakfast! And that goes for cold, dry UK conditions (we do get the odd day) as well as those abroad! The Arc'teryx Cerium LT Hoody was great for throwing on for short stops. After trying the Cerium LT Hoody I have continued to wear it on a daily basis. This helps to test its durability, which is proving to be excellent, particularly for such a light (275g) and delicate feeling piece. The DWR finish to the Airetica™ (100% nylon, 34 g/m²) fabric means that a few spots of rain or flakes of snow bead off easily and it also repels dirt and stains very well. It is very wind resistant and also breathable so this helps when wearing it as a midlayer during active pursuits like skiing. As well as Scotland, I also took it to the Alps (where the weather is cold and dry more of the time) and here, it really did excel! 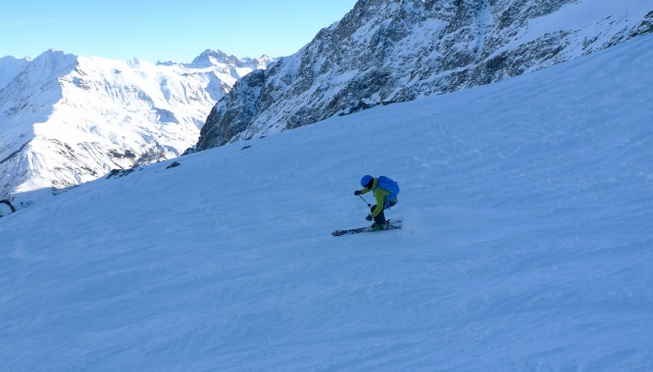 I wore it as a midlayer whilst skiing in La Grave, and it sat perfectly under a hardshell, the trim fit and hip length working intuitively with the body and other layers, not bulky and sitting well under a harness. 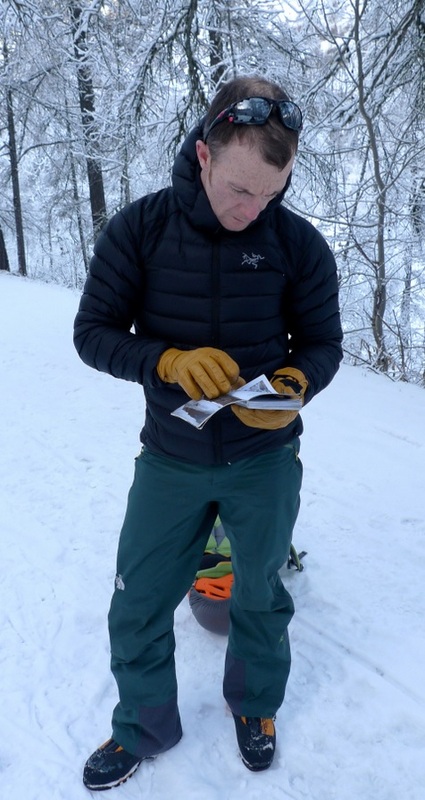 The Arc'teryx Cerium LT Hoody worked brilliantly as a midlayer in cold weather. I used mine layered under a hard shell when skiing as seen here in La Grave, France. Some times during higher exertion periods,I would stuff it into the internal stuff sac (a really nice and effective feature) and it would take up no room whatsoever in my pack due to the tiny pack size. If I stopped for lunch, it would loft quickly when unpacked and my size small sample worked equally well over my shell. I used it as light belay jacket on some ice climbs too, and the stuff sac clipped barely noticeable to the rear of my harness. One of the big positives this jacket has is it's simplicity. A great cut, simple cuffs, high quality down and 2 zippered handwarmer pockets are all you need (all the zippers on this jacket have been high quality and glove friendly by the way). Oh, and a hood. Which brings me on to my one minor gripe. A hood that is on a jacket that is designed for climbing or mountaineering pursuits, should always in my opinion, be able to work over the top of your helmet. You should not be thinking about taking your helmet off to put your hood up as this might put you in danger! Also if you put a down hood up and then put a helmet on, then you are going to compress the down and limit the insulating capacity. The hood works brilliantly without a helmet by the way, but I think on jackets like this they need to work over the top of a helmet too. Right, one final thing. I've been lying to you; this is not 100% a down jacket! Arc'teryx have been clever, as you would expect, and have put the down where it counts! In simple terms: "Strategic placement of synthetic and down insulation has Coreloft™ synthetic insulation, that retains warmth when wet, placed along the hem, collar, sleeves and underarms - areas prone to contact with moisture. 850 fill European Goose down lines the core and sleeves where warmth is most needed." This is a very nice feature and a good idea in my opinion and does make a difference in cold and dry environments when you are moving fast and sweating or cuffs and hems are getting damp through being in contact with snow. Synthetic insulation dries quicker and doesn't lose its ability to keep you warm when it is wet. So in conclusion, I love the Cerium LT Hoody in may ways and it feels truly luxurious to wear. It excels as a midlayer in the cool dry conditions for which it is designed and can be worn as a light outer layer/belay piece when you are not stopping for too long and the weather isn't too damp. The cut, fabric and quality are superb. The downside is that it will not be suitable for damp/wet weather but then, it really is not designed for this. A helmet compatible hood would gain this a 5 star rating in my book. I have 2 of these now, my first was the earlier version. The improved jacket has for me is better with the addition of an inside pocket and longer length. It still fits well under my Gamma MX and is a hugging fit allowing full movement. This jacket keeps me warm yet doesn't overheat, it seems to know what temperature I want to be.. Odd I know, but it's true. Bought this coat for my husband after seeing Ben Affleck wearing it in The Accountant! Fantastic coat, its really light and yet very warm. True to size and the colour is a really nice dark navy - very smart indeed. It comes with a bag in the pocket so you can easily squish the whole coat into it. Its quite expensive but thats what you pay for Arcteryx and you can't go wrong with this brand - so worth it. Bought as a skiing intermediate layer for North American trip as also have the hooded version for additional warmth/insulation during MTB longer breaks/stops on exposed rides at altitude, the hood being unnecessary with a ski helmet and hooded shell jacket. Very warm and super light, packing down extremely small. Works as an ideal mid layer over merino base long sleeve vest, (and micro fleece in extreme cold), with Gore-Tex shell jacket as outer, worked excellently for Canadian ski trip, on piste and backcountry. Good fit and shape which is one of the reasons I prefer Arc'teryx kit, and unlike some manufactures who ere on the side of slim to very slim it provides a close fit with plenty of room for movement. As always normal very high standard Arc'teryx clothing. Last year I purchased an Arcteryx down jacket (Thorium) as a mid layer for the worst weather days. I am an adaptive ski instructor at an outdoor artificial slope in the north of England, with rain, wind and cold being the norm! It was so good I bought the Cerium LT Hoody for a bit more protection and warmth, not disappointed. Working well with Arcteryx bad layers it keeps me warm and dry. As most uniforms now tend to be shells, rather than insulated jackets, it's brilliant to add the right warmth without the weight. Strangely I rairly get too hot, can't explain why, it just works. Also used it instructing in Switzerland and Italy when it was indispensable on the cold days. The other brilliant thing is that at the end of the season when the mornings can start cold and the days warm up, it's so easy to pack up in it's bag and stow away in the outer layer pocket. Truly versatile. For - fantastic quality, design and detailing; efficiency; versatility. Against - not much, price but you generally get what you pay for; it should last and last. Expedition box wall hooded 800 FP Down Parka for high and cold places. 675g. Lightweight and warm 800 FP Down belay jacket for the fast and light. 620g.